Video Game Character Inspired by PRINCE. Forums > Prince: Music and More > Video Game Character Inspired by PRINCE. Came across this, never knew that the character RAIN from Mortal Kombat was inspired by Prince. "Rain was me being a jerk, basically. [laughs] When we were working on Ultimate Mortal Kombat 3, I was thinking “what ninja color have we not done yet?” … and I’m a huge Prince fan, so I was thinking Purple Rain. I was probably still listening to the album. There was no time to actually make a character, because the game was done. So I hacked into the attract screen a quick little sequence of this purple ninja running at Shao Kahn. We didn’t even have the word “Rain” in the powerbar, so I manually built it using our font. So I included this quick glimpse just to drive people crazy. Once Mortal Kombat Trilogy came out, we gave Rain new moves and he finally became a real character. Later we brought him back for Mortal Kombat Armageddon. That’s one of the things about Mortal Kombat: many of the characters have these goofy development histories. Noob Saibot, Reptile…all of these odd origin stories." As a gamer, I LOVE this!! Thank you so much for sharing! I read this somewhere. when they gave the character a Bio. 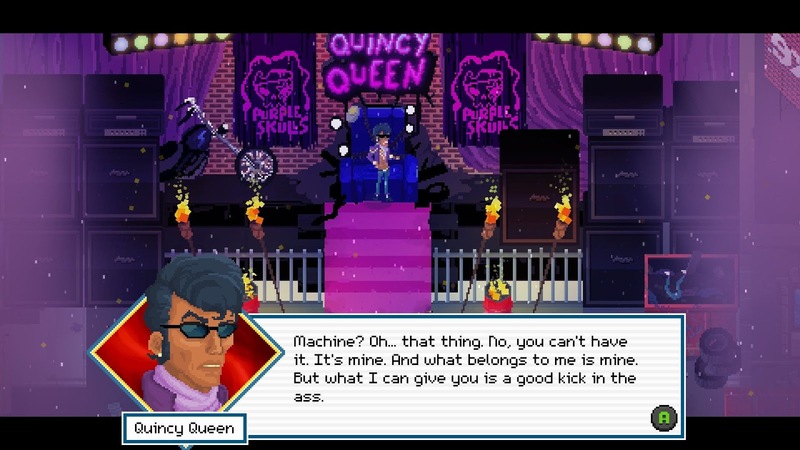 "Quincy Queen" in the videogame "Crossing Souls" is obviously inspired by prince. In 1989 I co-wrote the first MUD (a multiplayer fantasy text adventure) in Italy and in the world there was several fontains of the god of luxury called Kris Pher Toth, that was a silly anagram for Christopher, the main caracther of Under The Cherry Moon. Somewhere in the game there is also a stone with engraved some lyrics from Around The World in a Day. LOL, is it just me or does it really sound like something Prince would've said? Honestly, I would LOVE to have a whole video game with a main character based on Prince, just the looks though. There's a wrestler called Velveteen Dream whose character is obviously inspired by Prince. He even wears the 3rdEyeGirl glasses and all. And his theme song is very Prince-esque. Yeah, that's the guy. His entrance theme even sounds like a Prince knock off.